A project that ‘bubbled along in the background’ not only contradicts the inorganic textbooks, but also suggests a new material for photochemical applications. 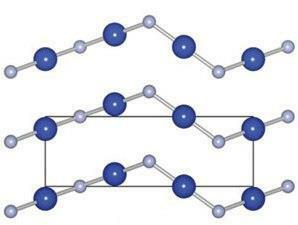 In fact, Aron Walsh from the University of Bath, UK, who worked on the calculations, describes cuprous fluoride as the ‘missing semi-conductor’ between zinc oxide and gallium nitride. Open your inorganic text book and look up CuF – you’ll be told either it doesn’t exist, or that it was synthesised in 1933 and has a sphalerite structure. That’s what Walsh and his co-workers discovered when they were trying to do a systematic review of crystal types and what compounds form them. But modelling the compound in this structure showed that it wasn’t stable; they couldn’t explain why CuF would form the structure reported and so they did a little digging. ‘If you look at every textbook and database, it’s essentially referring back to that paper from 1933,’ explains Walsh. Other projects came along, but the mystery of CuF was intriguing. With some spare time and resources, people started performing calculations to try to suss out if CuF could even exist. ‘We tried to work out what structure the material would adopt and then what possible reactions and properties would it have,’ says Walsh. Instead of the reported structure, CuF is predicted to form linear chains that will orientate in a chiral cinnabar arrangement. It also has promising optical and conducting properties, including an ionisation potential that suggests that doping CuF with ZnO or CuO2 would create a ‘type II’ band offset for converting visible light into electrical power. That’s something that Walsh cheekily alludes to at the end of his paper. ‘In principle, I think it could be made and we tried to give some motivation by predicting what properties it would have if you managed to make it,’ he says.